To get your shed plan started correctly you have to build on level ground or you have to know how to build a shed foundation on uneven ground. Depending on the local building codes where you are you may need to build your corner posts on concrete pads or even on deck blocks or concrete blocks. 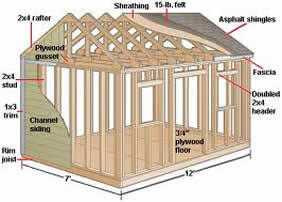 Some areas will allow you to build directly on the ground using pressure treated lumber. Here is a video showing a simple method of building directly on the ground with pressure treated corner posts. 1. Using 2×6’s make a square in the exact dimensions of the building. 2. 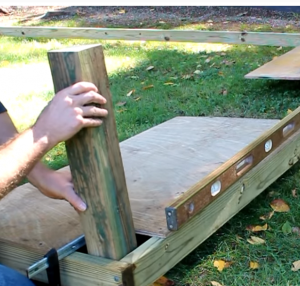 Use deck screws with washers to assemble the foundation frame. 3. Measure corner to corner to make sure the frame is square. Adjust the frame until the measurements are the same. 4. Use some plywood to lock the frame in place so it stays square. Leave an opening in the plywood so that you can drive spikes into the ground to mark the locations. 5. Set corner post into the opening in the plywood and attach them with clamps. Adjust the frame until it is level before tightening the clamp. 6. Mark where the frame is on the post before loosening the clamp to adjust the frame to level. This gives you a good reference point. 7. Check diagonally across the frame to ensure it is level. 8. Use deck screws and lag bolts to lock the frame to the post. 10. Paint the boards on all sides and ends with all weather roofing cement to prolong the life of the wood. 12. Use the square to mark the frame where the floor joists go. 13. Clamp a small length of 2×4 to the frame so that you can set the floor joist on it for support while you attach it to the frame with the deck screws. 14. Fill the open space between the floor joists with rocks, chunks of concrete, broken glass and other materials to keep animals from making their home under your shed. 15. Add some pressure treated 2×4’s next to your floor joists on the inside of the frame. These will be used to help keep the apron in place so that the rocks and chunks of concrete stay underneath your shed. 16. 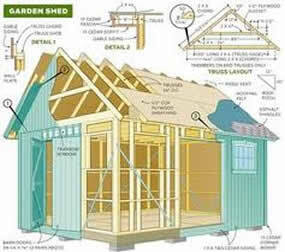 Use pressure treated plywood for the apron and paint it with the roofing cement to prolong its life. I’d like to add some notes to this method. These are just my thoughts so take them with a grain of salt. First off, I would recommend using a concrete pad, block or deck block under the corner posts. I would also anchor the posts so that the shed can’t move or be blown by the wind. Second, I would add some vents to the apron so that there is less of a chance of the trapped air creating a moisture or mold issue underneath the shed. Third, I’m not wild about filling the void between the joists with rocks and glass. I understand his reasons for doing that, I just feel like most rodents will still find voids in between the filler and make a home there anyway. Maybe just broken glass would be enough to discourage rodents from trying to live under there. Other than that, I like the way Jon explains his building techniques. I found his tip on clamping the 2×4 to the frame to support the floor joist so you can screw it in place by yourself to be very valuable. 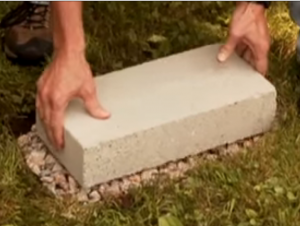 This is a great video to give you ideas on how to build your shed foundation on uneven ground.